I can't be in the same room with an accent and not pick it up. I have to control this in public because it's obnoxious, mate. I took two of my boys to the dentist this month, and between them they have ELEVEN cavities. For as much as it's going to cost to fix these BABY teeth, the tooth fairy better leave some serious bank when they finally fall out. I read the forwards people send me, but I have a pretty strict trial basis. If the first one you send me is lame, I will probably delete everything else you send me... forever. Sorry. I've never understood what the big whoop is about butter. Pioneer Woman is always yammering on about how butter makes everything better, blah blah blah. Then the other day I felt a little sassy so I picked me up some salted butter and made some fresh bread. Up till that point I'd only ever used unsalted. Conclusion: HELLO, little yellow friend, where have you been all my life?! My friend Jennifer and I were talking this week about chewing our nails, and I realized there is a direct correlation between the state of my fingers and how much blogging I do. Apparently I have time to either paint my nails or write a post, but not do both. The year I only wrote 29 posts, I had the best, most-polished nails of my life. Nowadays.... yeah, let's not talk about that. I bribed my three year old into taking a nap by sending him to bed with a tootsie roll. I thought it would be our little secret, but tonight at bedtime he pipes up with "Daddy! Mama lets me take naps with CANDY!" I overheard that same three-year-old telling Jarrod that he's afraid of the dark. While Jarrod was soothing him and saying all kinds of nice things, I was thinking to myself, "Yeah, well, I'm scared of sloths... we all gotta deal, buddy." For real though, sloths have to be the creepiest thing in existence. You know why? It's because they would move so sloooooowly as they chase you through the forest. Slow and steady wins the race and all that. 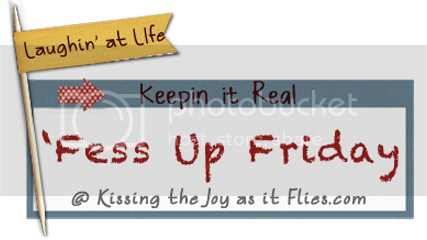 If you're 'fessing up this week, grab a button for your post and leave me a comment with the link so I can come visit. I love Fridays because I get to hear your confessions too :) Adios, amigas! This is fun! It made me think of last summer when I went to the Dallas Aquarium and noticed a sloth hanging in a tree next to me... It creeped me out. I received an email from my friend who is a very accomplished musician. She said that she had, “been gigging a lot and catching up on stuff.” I read it as she had been GIGGLING a lot (she was referring to what a musician calls GIGS, which is getting music jobs) Anyway, I replied and went on and on about how important it is to giggle and how my daughter makes me laugh and how my friend does this “Fess up Friday” where we get lots of giggles. She replied that she said “GIGGING”, not “GIGGLING” but she very nicely told me that she has been giggling too. HA! Taught me to never read emails fast again! On top of all that I am a musician and totally know what a gig is! I can be such a dork! LFR. Oh my gosh, that giggling story made me laugh really hard. See how sweet you are? It doesn't matter what people want to talk about, you meet them halfway. And that's why I love you. My husband and I found a sock in one of our toilets this week. Since our only child is not mobile yet, we came to the conclusion that our dog must have put the sock in the potty (because neither of us did it!). She DID, after-all, show Andrew that the sock was there in the first place (which is all very strange to me because she is not the kind of dog that has EVER taken a drink from the a toilet, nor cared anything about it!). I wonder sometimes if Boston is really a human three-year-old because she certainly acts like it and maybe this was just a cry for attention! Now my husband realizes the need to close the toilet and we haven't found anymore socks since!